Leave the stress to the competitors and focus on creating an outstanding event, every time! Our system keeps your show safe. There is nothing to install and nothing to configure. It runs everywhere, from pocket to desktop. Have you ever been in the situation where you wonder who made a certain change? We track everything, so you can get full history of all actions with undo/redo capability. A show is all about the riders, horses and their starts. From the People view you see all riders, horse owners and other people connected to the show. Clicking on one of them will take you to an overview of the related starts. Make changes in-place, no need for extra dialog windows - everything should feel near and give a good overview. You can drag and drop starts in the order you want, but this is not always suitable. There are two other ways of moving starts within a list, both accessible via the right-click menu; first there's Position on withdrawn place, which will let you choose between withdrawn starts' positions. Secondly, there's Reposition, which will show all starts by the selected rider and the number of starts between them. You can then easily move their starts up/down in increments of 1 or 10, or to the top/bottom of the list with a single click. A system like this would not be complete without a great economy system. For each competition, you set an entry fee, start fee and prize money with support for different currencies. You can also specify whether starts should be linked to a meeting or veterinary fee, or even if the organizer club's riders should get a discount. Riders often have starts paid by different people, as the horse owner generally pays for their horse's starts. When you add a new start the system will try to guess who's to pay for it and more often than not this will be correct. However, in some cases it will not and then you can, of course, easily change it. Gone are the days when everything needed to be printed - receipts and invoices can be easily emailed from within the system. Of course, you can easily print them too if you wish. For an overview of the economy there's a full result and balance report, where you can see the incomes and expenses for each competition and the show as a whole. We knew that the first discipline to be integrated in our new cloud platform would be dressage. Smartphones are everywhere so why bother setting up a local network to enable live scoring in dressage? 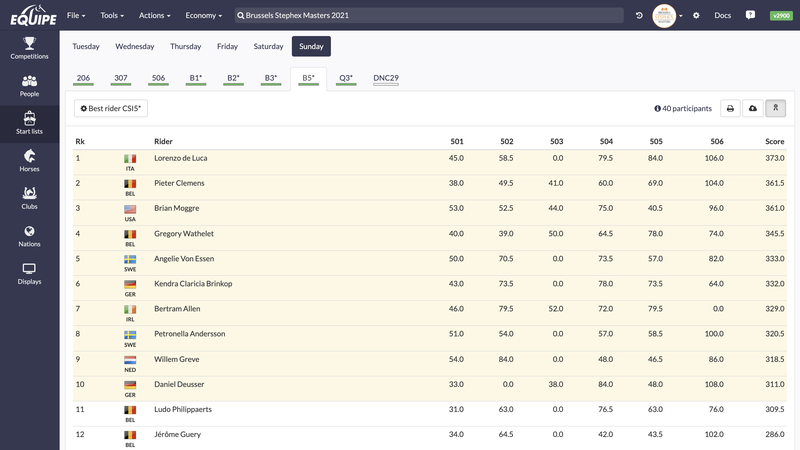 In the results view you follow and control the actual competition with a bird's-eye overview. You see the latest submitted result, the current rider on the course with live percentage, a progress bar indicating the status of the judge. Results that have been corrected will be marked either as equal (unchanged) or changed for higher or lower. This is important so that corrections can be announced to the audience. One person can manually check the marking sheet, thanks to the integrated read function. Easily switch between compact result view and detailed view with all scoring, support for team result is also integrated. This view can also be seen as a supervisor panel, where you are able to change the scores during the ride. We support over 50 different show jumping judgements. 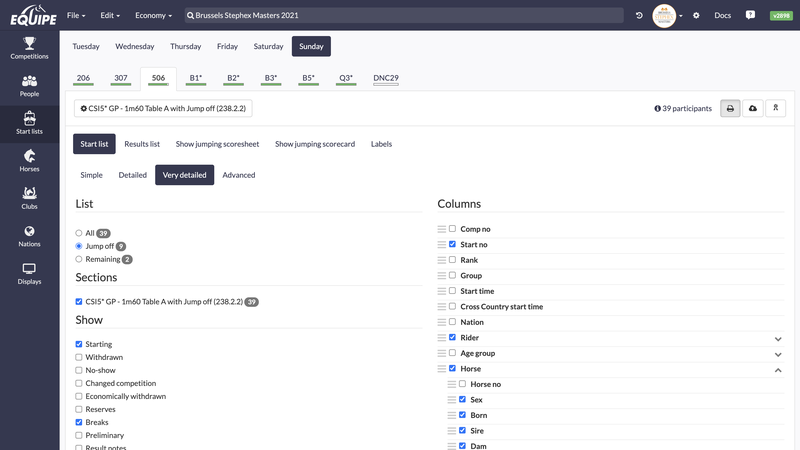 But what's more important is that they are all built using our show jumping judgement editor, which means they're fully customizable by you. This is also shared by team jumping. The user interface will always be up-to-date, everywhere - no matter how many webbrowsers you connect. You may think we are crazy, but the timekeeping is made directly in the browser, connected to a small bridge that converts the serial interface of the timekeeping device to a websockets interface. This gives the best of two worlds. You connect the timekeeping device locally and the running time will be presented in every browser window you open. When it comes to cross country you will add the number of obstacles and we will render an online spreadsheet for you. Left click to mark the obstacle as clear, or right click to select an action. As everything else, this will always be up to date, everywhere. So let's put up another screen for the speaker or ground jury, so they can follow the results in a nice visual way. What good would it be to the have all data for open scoring, timekeeping, horse/rider information and sponsor logos without the ability to show it to the audience? We believe that relevant information should be available to both riders and audience everywhere. We also believe that operators have much else to focus on during a show and shouldn't need to worry about what's shown on the different displays and when; the system can do that for you. You can create any number of scoreboards, each containing any number of scenes that you can choose from in the director view. If you want to change scenes automatically it is possible to set rules for each scene. For example during count down you can have one scene, during running time another scene and so on. A scene is composed of a number of components. Each component take care of rendering it's specific piece of live data and everything is always up to date. You can choose from a number of high quality templates that we provide or you can build your own. Most users will never change the default settings, but when you do need to, you can. Select from all available fields in the database and everything will align beautifully - detailed information about horses and riders will show up below their names respectively. Never be in a situation where you think the software can't include the desired data. 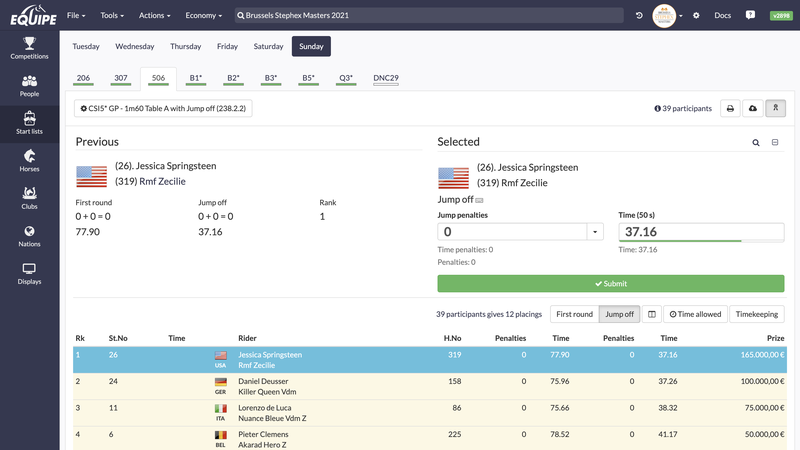 Out of the box we support Start lists, Jump-off Start lists, Result lists, Team lists, Team result lists, Team form for Chef d'Equipe, Show jumping score sheets, Marking sheets - all marks are stored in our database and new ones can easily be added if you have local sheets for your country. Stable lists, Box signs, Electricity signs, Rider lists, Horse lists, Veterinary lists and Club lists. Software development isn't just about solving problems, it's about solving the right problems in the right way. Not the imaginary ones that usual comes up during long meetings. Working at the show ground guide our priority in the development of Equipe. You maybe have heard of some other solution for rider declaration somewhere. But this is where a web-based system really stand out. Without any configuration you can just put up a few iPads or laptops in the show office with the rider declaration view open and you are ready to receive entries. 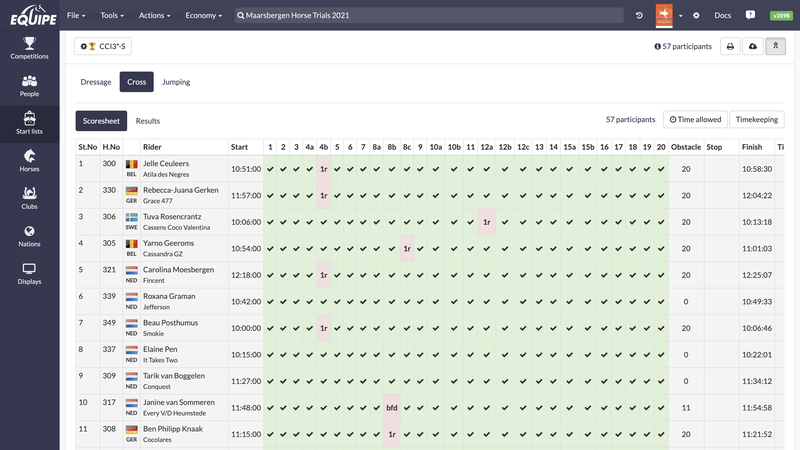 Together with this we have a backend view where you can follow and see how many riders and horses are left to enter for the next day, even per event. Along with that you also see if there are some rider that hasn't selected any horse for the next day. All this so you know when it's possible to do the start lists. As the results of a competition is one of the most important things, there's also cases where you need to create another form of result list. Maybe there's a prize for leading rider, or if the qualification for the grand prix involves several competitions. For that we have the score summary. 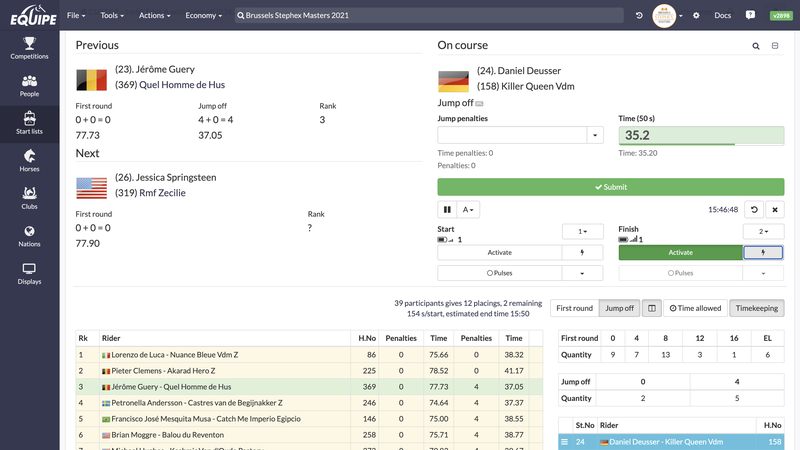 In the score summary, you can select other competitions, and based on the rank there, hand out points to the rider or horse. There are several presets for distribution of point. But you can also customize it by yourself. 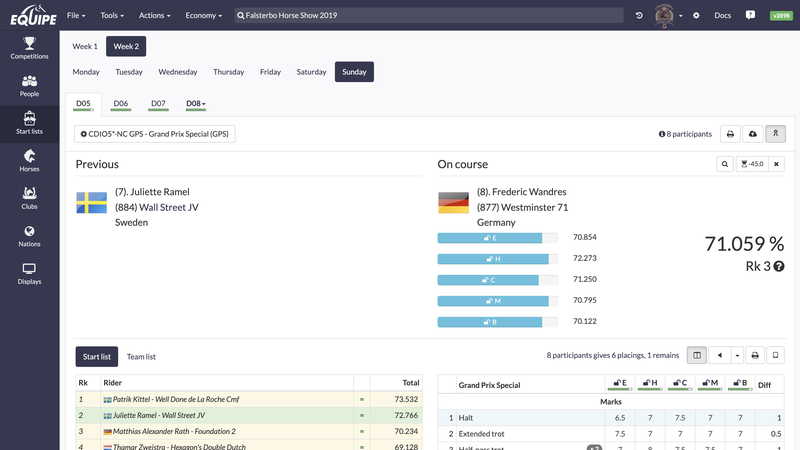 The tight integration with FEI OC web services allows you to import the competition schedule and automatically map them to the corresponding judgements. 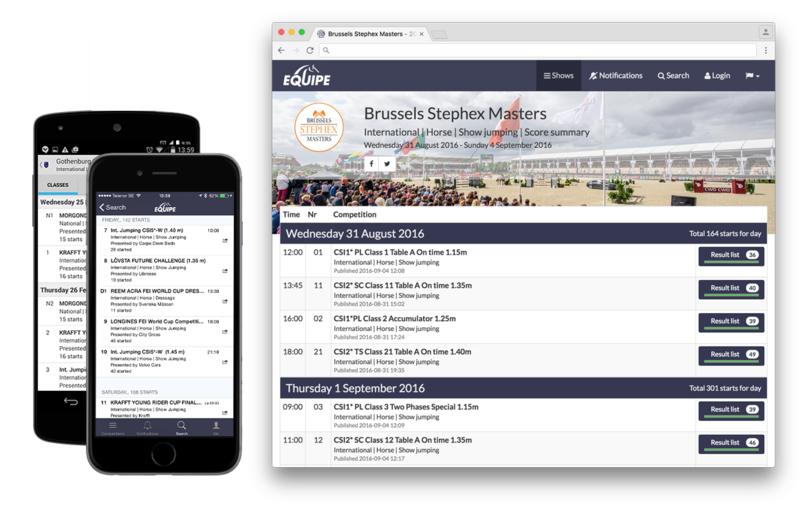 You can then import all entries from the FEI Entry system with a single click, without ever leaving Equipe. 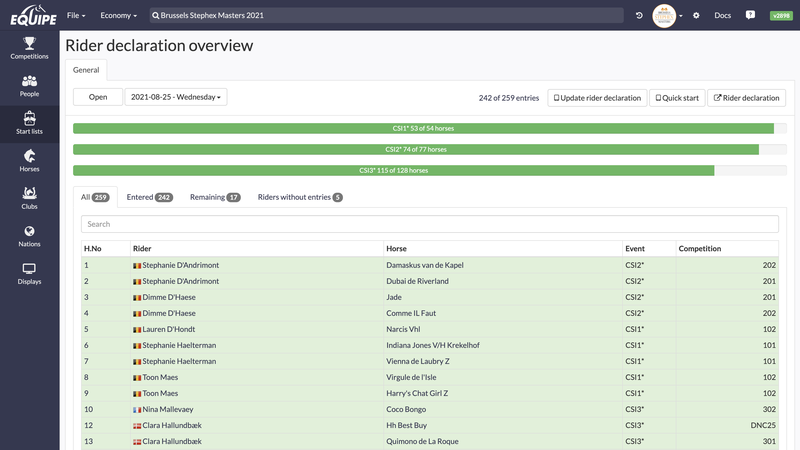 Additionally, you can search for FEI riders and horses directly from within the system. 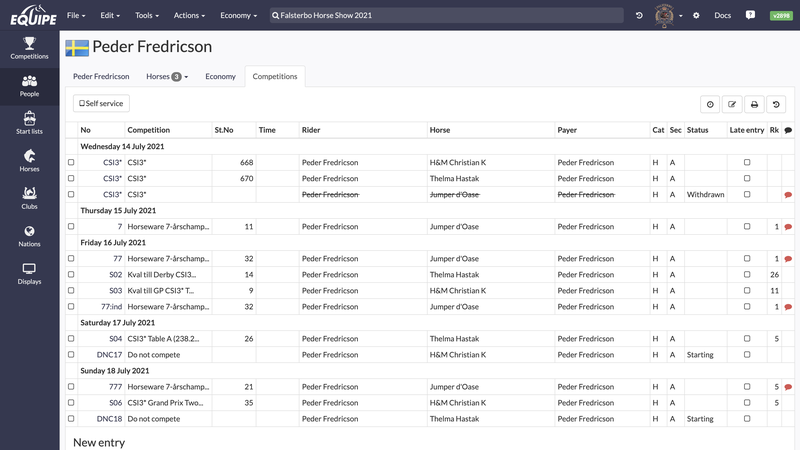 Once the competition is finished, easily export the results to FEI with the click of a button. There's no other system with a better integration. app.equipe.com powers online.equipe.com, our famous online-result service, integrated with native apps for both Android and iPhone. You get an up-to-date start list with just a single click. Every time a result is submitted for a rider/horse, it will automatically get pushed to Equipe Online and push notification will be sent out to people with accounts following the rider or horse in question. A more integrated and tight system does not exist. We have been pioneers in the equestrian software business since 1988, building a robust ecosystem with reliable solutions. Get a feeling of how the system is laid out and how it works with help of these screenshots. I have dedicated my life to software for equestrian sports, been developing our windows software for 15 years. The work on our new system - app.equipe.com is all about perfection. A possibility for me to correct old mistakes and make a more powerful system, easy to use and adaptable to new markets. It's an interesting time at Equipe right now. We all share a great feeling, the beginning of a new era. We are all tired of complicated setups, that people with great knowledge of how to run competitions are in the hands of IT support. This is a system of the 21th century. We believe that in order to build a great product, we need to work with great organizers, running great shows. Many parts of the application are built on site at the competition arenas, where we feel the adrenaline and the pulse of the event. This is part of being a developer at Equipe. It's a great job. During the last year we have been working closely with OCs, receiving feedback early in the process of development to make sure that the experience in app.equipe.com is outstanding. It's funny, how all worries about this system running in the cloud has turned out to be a great possibility for our early adopters. The team is using the latest and greatest innovations when it harmonizes with the concept. But not all new things shine, the team have taken mature decisions, keeping the database structure of Equipe Classic enabling state of the art synchronization capabilities. I made the foundation in 1988 which prove that a good database design will survive their applications multiple times. Often young developers do not respect the knowledge collected over decades. This is not the case at Equipe. What happens if the internet connection is lost during timekeeping? Nothing really. The system continues to run in the browser and because it's connected to the timekeeping device locally it will continue to operate. The results will not be persisted during downtime but as soon as the connection is back, the next time you save a result everything will be saved. Can it handle my currency? Sure, the economy system is solidly built to support this. The show runs in one currency, the prize money can be in different currencies. You set the exchange rate under settings. There is support of VAT, income tax and foreign tax. In the economy report you are able to browse around to see where specific fees origins. I need a report with specific fields and with sponsor logos? No problem. Even if the system comes with great defaults. You are in control of all fields in the reports. You can customize your own. Under settings for a competition, go to sponsors logos. There you can upload logos and then just drag them to the desired position, you can add as many as you want. Does the automatic time schedule support multiple arenas and can I change individual sections start- and pause times? Yes, you can. Set the arena name of the competition or just drag the competition between arenas in the time schedule. Click on the pause or sec/start to change it just for one. The schedule will learn from you past days to set correct times. You can override it until the competition start, the real times procedures by the system will be used. Can I control that riders with starts in multiple competitions not start to close to each other? Yes, you can! This is really useful for all discipline when multiple arenas are used. Without doing anything the system will calculate estimated start times for all competitions. On top of that we estimate the start time for each start, letting you filter riders that have less then X minutes between starts, and also show riders that have more than X minutes between starts. Can I be an agent for this system in my country? We are constantly looking for devoted and respected people with the local knowledge of the targeted country. The local judgement needs to be imported, marking sheet for dressage needs to be managed. Are you that person? Contact us. Our federation wants licenses for all of our organizers? We have special deals when not bought per organizer. We use this for Finland for example. Then the federation has the possibility to support organizers in the country and help to manage the shows. Can it handle qualifications over several competitions? Yes, you create a competition with the discipline of Score summary, this let's you calculate qualification in several different ways, by points, reversed rank, rank or percent. You can also set deviations from this, to make the points series as you want without having to know the number of starts beforehand. Does the system support different languages? Yes, at the moment we support English, Swedish, Finish, Spanish, Dutch and French. As the system grows, we will also add more languages along the road.